Disclaimer: The opinions expressed here are my own and do not necessarily represent those of current or past employers. We continue to consume millions of the Nitro ASICs every year so, even though it’s only used by AWS, it’s actually a fairly high volume server component. 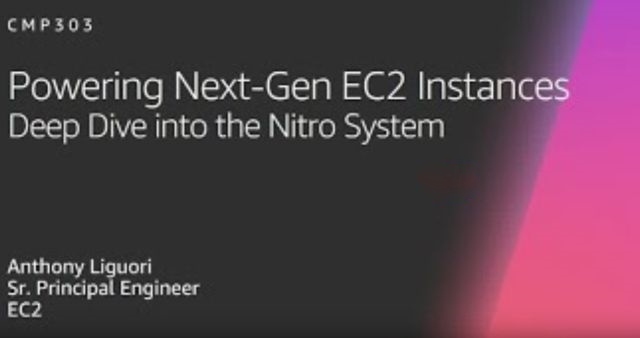 This and follow-on technology has been supporting much of the innovation going on in EC2 but haven’t had a chance to get into much detail on how Nitro actually works. At re:Invent 2018 Anthony Liguori, one of the lead engineers on the AWS Nitro System project gave what was, at least for me, one of the best talks at re:Invent outside of the keynotes. It’s worth watching the video (URL below) but I’ll cover some of what Anthony went through in his talk here. These features formed the backbone for Anthony Liguori’s 2018 re:Invent talk and he went through some of the characteristics of each. The Nitro card for VPC is essentially a PCIe attached Network Interface Card (NIC) often called a network adapter or, in some parts of the industry, a network controller. This is the card that implements the hardware interface between EC2 servers and the network connection or connections implemented on that server type. And, like all NICs, interfacing with it requires that there be a specific device driver loaded to support communicating with the network adapter. In the case of AWS NICs, the Elastic Network Adapter (ENA) is the device driver support for our NICs. This driver is now included in all major operating systems and distributions. The Nitro Card for VPC supports network packet encapsulation/decapsulation, implements EC2 security groups, enforces limits, and is responsible for routing. Having these features implemented off of the server hardware rather than in the hypervisor allows customers to fully use the underlying server hardware without impacting network performance, impacting other users, and we don’t have to have some server cores unavailable to customers to handle networking tasks. And, it also allows secure networking support without requiring server resources to be reserved for AWS use. The largest instance types get access to all server cores. It wasn’t covered in the talk but the Nitro Card for VPC also supports a number of network acceleration features. The Elastic Fabric Adapter (EFA) uses the Nitro Card network acceleration features to provide user space networking capabilities similar to those found on many supercomputers. Customers wishing to take advantage of EFA can use the OpenFabrics Alliance Libfabric package or use a higher level programming interface like the popular Message Passing Interface (MPI) or NVIDIA Collective Communications Library (NCCL). Whether using Libfabric, MPI, or NCCL, applications bypass the operating system when talking to EFA, and are able to achieve more consistent performance with lower CPU utilization. MPI and NCCL are commonly used package in science, engineering, and machine learning applications and, to a lesser extent, distributed databases. The Nitro Card for EBS supports storage acceleration for EBS. All instance local storage is implemented as NVMe devices and the Nitro Card for EBS supports transparent encryption, limits to protect the performance characteristics of the system for other users, drive monitoring to monitor SSD wear, and it also supports bare metal instance types. Remote storage is again implemented as NVMe devices but this time as NVMe over Fabrics supporting access to EBS volumes again with encryption and again without impacting other EC2 users and with security even in a bare metal environment. The Nitro card for EBS was first launched in the EC2 C4 instance family. The Nitro Card for Instance storage also implements NVMe (Non-Volatile Memory for PCIe) for local EC2 instance storage. The Nitro Card Controller coordinates all other Nitro cards, the server hypervisor, and the Nitro Security Chip. It implements the hardware root of trust using the Nitro Security Chip and supports instance monitoring functions. It also implements the NVMe controller functionality for one or more Nitro Cards for EBS. The Nitro security chip traps all I/O to non-volatile storage including BIOS and all I/O device firmware and any other controller firmware on the server. This is a simple approach to security where the general purpose processor is simply unable to change any firmware or device configuration. Rather than accept the error prone and complex task of ensuring access is approved and correct, no access is allowed. EC2 servers can’t update their firmware. This is GREAT from a security perspective but the obvious question is how is the firmware updated. It’s updated using by AWS and AWS only through the Nitro System. The Nitro Security Chip also implements the hardware root of trust. This system replaces 10s of millions of lines of code that for the Unified Extensible Firmware Interface (UEFI) and supports secure boot. In starts the server up untrusted, then measures every firmware system on the server to ensure that none have been modified or changed in any unauthorized way. Each checksum (device measure) is checked against the verified correct checksum stored in the Nitro Security Chip. The Nitro System supports key network, server, security, firmware patching, and monitoring functions freeing up the entire underlying server for customer use. This allows EC2 instances to have access to all cores – none need to be reserved for storage or network I/O. This both gives more resources over to our largest instance types for customer use – we don’t need to reserve resource for housekeeping, monitoring, security, network I/O, or storage. The Nitro System also makes possible the use of a very simple, light weight hypervisor that is just about always quiescent and it allows us to securely support bare metal instance types. Any plans to support peer to peer DMA between NVME / Network devices via Nitro? There is nothing on the short term horizon but thanks for the suggestions. You mentioned that Nitro card controller also implements the NVMe controller functionality for one or more Nitro Cards for EBS. I am curious why not make Nitro Card for EBS itself as a NVMe controller but instead of going through Nitro Card controller. Or I guess Nitro Card controller is just on the control plane but all NVMe traffic still going through Nitro card for EBS. Thanks a lot. I’m pretty sure you are correct that it’s just the control plane. Good to see Nitro in action. Question re: EBS impact, is there any document / presentation on what to expect for EBS performance with the new Nitro cards / hypervisor. No, not to my knowledge at this point. For the Nitro Network adapter, no matter for VPC or EBS, the network traffic will be 25Gb based, the PCIE Gen3X8 /16 can handle with any problem. But for the local instant storage, single NVMe SSD will be Gen3X4, so one Nitro only can up to 4 NVMe SSD, the standard server can support more than 4 NVMe SSD, how Nitro deal with this ? Add one more Nitro chip for another 4 NVMe SSD ? If more resources are needed, additional Nitro cards can be used and several AWS instance types use more than a single card. Fascinating piece of technology and one of the best examples of HW positioned right and making a huge difference! The great James Hamilton: Hi! Re: Nitro for VPC: EFA was mentioned in conjunction with SRD at re:invent by another talk in the HPC track, is that transport protocol hardware accelerated as well? What’s next for Nitro in the context of not just EC2s and it’s networking infrastructure: I’m wondering if application layer specific things (like required for CDNs for media, esp imgs and video, where not just latency and throughput but enconding is paramount, or even deep packet inspection for DDoS protection)? Also, I hope you resume doing TNLs at AWS re:invent. Yes, you are correct. The SRD protocol is also supported by Nitro for VPC. Thanks for suggesting the link. I totally agree. This was some of the most detailed and most interesting material we presented at last years conference. Thanks for the pointer to notes.